The right fabric is an important part of your bespoke garment. That’s why we have hundreds of colors and patterns to choose from. The fabric type, weight and “super” numbers are other criteria to keep in mind when designing your bespoke suit. The Super number indicates the diameter of the fibers, measured in microns, used in making the cloth. The International Wool Textile Organization (IWTO), the recognized global authority for standards in the wool textile industry which represents the interests of the wool textile trade at a global level, governs the Super designation. 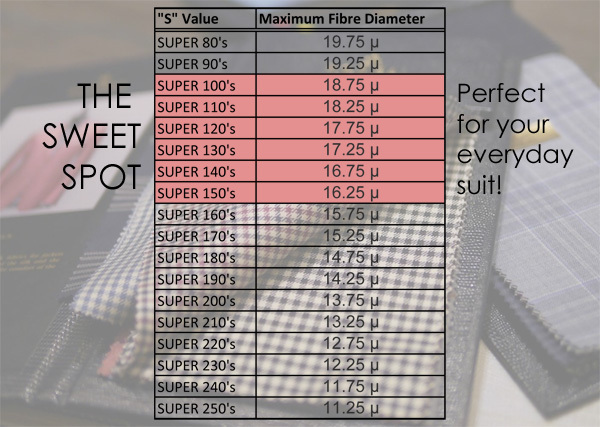 The word Super (as in Super 100’s, for example) can only be used to describe fabrics made from pure new wool, and the “S” value is determined by the maximum fiber diameter. The Super “S” description can also be used for fabrics made from wool blended with rare fibers (such as mohair, cashmere and alpaca), and also with silk. The inclusion of elasthane to give the fabric a stretch effect is permitted, as also is the inclusion of up to 5% non-wool yarn for decorative effects. A number higher than 150 will typically be a much thinner fabric and will not take as well to the needle as a fabric with a lower Super Number. For day to day wear, we recommend “the sweet spot” between 100 and 150.